You probably know a lot about our planet today. For instance, you know it has an atmosphere and a crust covered in vegetation, water and living things. But our planet has not always looked this way. In fact, in the beginning, it was a noisy, liquidy ball of molten lava. 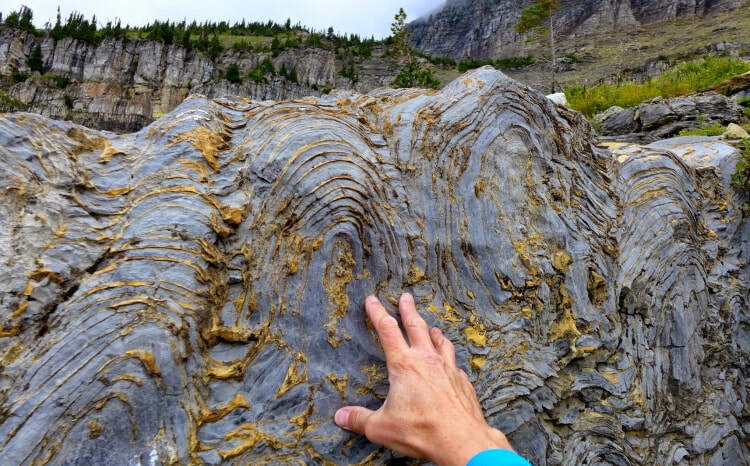 This ball of lava shows the beginning of the Pre-Cambrian Era. It started with the birth or Earth, 4.6 BILLION years ago. It lasts until 570 million years ago. That means more than 80% of Earth's History took place in the Pre-Cambrian. During that time, there were horrible storms. The Earth's crust melted and solidified and melted again on top of the ocean of lava. The Earth was very radioactive and plagued by meteor storms. and eventually a primitive ocean was formed. In this ocean, after a couple billion years of cooling down, the earliest forms of life appeared: ancient algae and cyanobacteria. These little photosynthetic animals spent millions of years releasing oxygen into the atmosphere and helping cool the Earth down further. was the appearance of cells with a nucleus. sponges, jellyfish, seaweed and segmented worms. and it ended about 485 million years ago; it lasted about 50 to 55 million years. It marked a huge shift for Earth's lifeforms: life got really creative, with more and more multi-cellular organisms appearing in the ocean. This rapid diversification was called the "Cambrian Explosion". This was the birth of brachiopods (ancient clams), starfish and jawless fish. 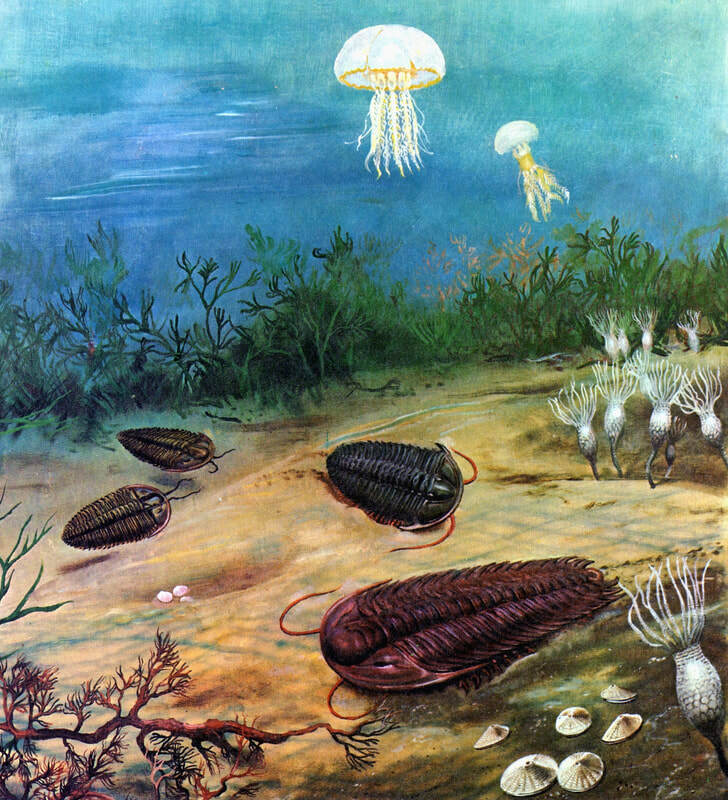 Different algae species evolved, as well as armored arthropods such as trilobites. The Ordovician period was about 40 million years long, spanning from about 485 million years ago to about 445 million years ago. This was a time when many of the species we still have today evolved, such as fish in their primitive form, primitive cephalopods such as the Orthoceras, and coral. The most common forms of life were trilobites, snails and shellfish. In the end of the Ordovician, the first ice age occurred, turning the Earth into a ball of ice and killing 60% of marine invertebrates. 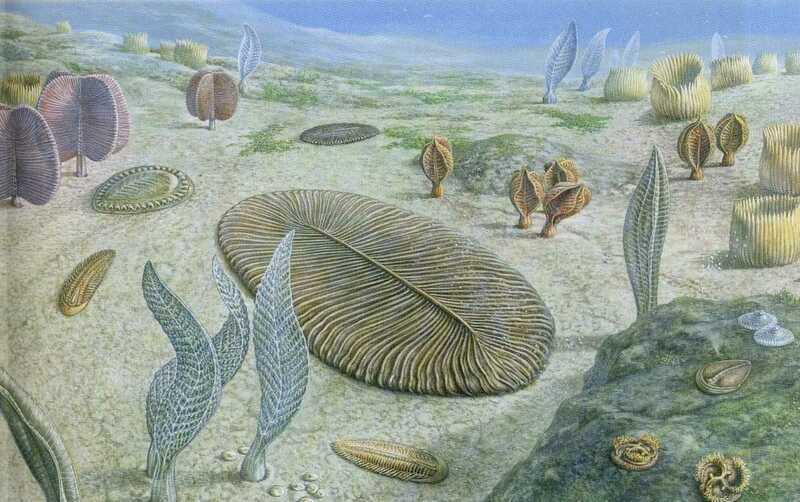 This was the First Mass Extinction, also known as the Ordovician-Silurian extinction. After the Earth thawed out, life slowly started multiplying, evolving and populating the almost barren oceans. During the Silurian, which lasted from about 445 million years ago to 400 million years ago, there were four continents, and the oceans in between provided habitat for many different species; there was space enough for animals to conquer large areas. The Silurian saw a mass evolution of fish. Jawless fish evolved into jawed fish and evolution brought forth the first freshwater fish, bringing life to rivers and eventually lakes. Giant arthropods such as sea scorpions remained apex predators for this period. Early arachnids, fungi and centipedes started venturing outside the water, and the evolution of the now-extinct Cooksonia allowed plants to spread throughout the land. These were the original ancestors of all the plant-life on Earth. 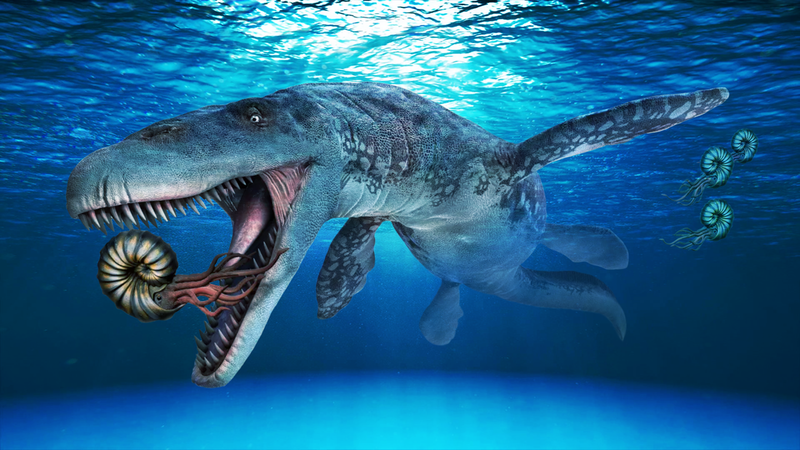 The Devonian period spans from 419 million years to 359 million years ago. It is known as the "Age of Fish" because of the huge diversification of fish life, including armoured fish and lobe-finned fish, which eventually developed limbs and became the first tetrapods (four-limbed animals). It was during the Devonian that animals and plants started making an effort to colonize dry land. Plants sent our spores and by the end of the Devonian, had developed leaves and roots. The first ammonites appeared, while trilobites were still common. By the end of this period, the Second Mass Extinction took place, the Late Devonian Extinction, killing all ammonites and most marine life. The reason for this extinction is still unknown, but it affected mostly warm-water animals. The Mississipian and Pennsylvanian periods can be compressed into one period, the Carboniferous. This period spanned from the end of the Devonian, 359 million years ago, to the beginning of the Permian Period, around 300 million years ago. The name Carboniferous means coal-bearing (from the word Carbon). Why do you think they named this period like that? During this time, life on dry land was well-established, and the levels of oxygen were the highest ever recorded -- 35% of the air was Oxygen back then. Amphybians were the dominant land vertebrates; arthropods were also very common. Plants and forests were well established, hence the large coal deposits forming during this time. Right at the end of this period, a climate change propelled the vast forests to collapse, leaving behind large deserts. The Permian started about 300 million years ago and it went until the beginning of the Triassic, which is part of the Mesozoic Era. This is an amazing period as it saw the diversification of animals into the ancestral groups of mammals, turtles, scaly reptiles and archosaurs, which are the ancestors for the birds and crocodiles. This happened because the new, expansive deserts were very harsh for the amphibians; evolution found a way by generating animals which were better adapted to living in dry land. The end of the Permian saw the Great Dying, or the Third Great Extinction, which killed 96% of all marine species and 70% of all dry-land species.